While the Weekender Bag and I are still maintaining our separate lives, I finally have a finished quilt top. After spending nearly three glorious days with my friends and my sewing machine, the Single Girl quilt top is completed. Do songs ever endlessly loop through your brain? The whole time I was sewing Single Girl, and including times during the night when I would wake up briefly, I could NOT get Beyonce's song, "All the Single Ladies," out of my head. Okay, Beyonce, I get it. The name of my quilt is "Put a Ring On It." I'm pretty happy with it. Um, both the name and the quilt top. This was the view from my ironing station. After all the curved piecing that SGQA entailed, I was kind of on a roll, and moved on to my 3x6 Sampler Quilt Mini Bee, the same block done in six different color schemes. Of course each block will be in the hands of a different person, but even with all the variations in colors, isn't the secondary circle design cool? I'm planning on doing a Sherbet Pips quilt using this block. I got the block information from Mary at Molly Flanders. It's called Flowering Snowball. Thanks, Mary! By then it was late Saturday night and I was tired of curves. So I started working on Supernova. Yes, just a bit behind on the schedule. I had changed my mind so many times on which fabric to use. 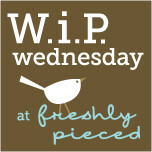 Then I was staring at Lee's blog button, with all the hot hot hot colors against the cool grey. I haven't sewn with batiks in ages. In fact, most of them have been given away. But for some reason, I had saved all the colors Lee used in the button. So here is my first block. I adore the block and can't stop staring at it. Worth the wait, I think! Don't forget to see what everyone else has been working on this week! Oh, yay for you and your Put a Ring On It! It looks fabulous! And I love your first Supernova block, too, looks super! Your curves are beautiful! And so is your supernova start, I never get tired of seeing that block - yours is beautiful! I love love love the flowering snowball block! I think I need to add that to my to-do list! Wow, you really were on a roll! Look at all that sewing! Your Single Girls quilt looks fabulous. I can just imagine how great it feels to have that one all pieced together. I adore your Supernova block too - fab colors! Looks like a fun block to make. Your Single Girls quilt is beautiful, I don't know how you manage all these curves. I love the Supernova block, great colors! I know what you mean about having songs go through your head. Have you ever seen The Pigs version of Single Ladies? It's on YouTube and worth a look. Your quilts are wonderful--and I really enjoy reading about your thought processes behind each quilt (note to self: do a post like this!). I LOVE that snowball block and that secondary design that comes up. Was sewing the curves a pain? Put a Ring on It! I love it! It is great! All of those curves as wonderful! And I love your Supernova block!! Looks great! 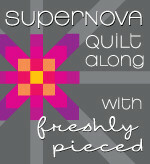 You super nova fabrics are wonderful and definitely worth the wait. In fact, all the quilts you posted are fantastic! Wow you got a lot done this weekend! What a great view! Sounds like lots of fun! I love your Single Girl quilt top! It's so beautiful! Also, that song is stuck in my head! Love the other blocks you made too! Great progress! Your single girl looks so awesome. P.S. I'm completely jealous of that ironing station you've got going there! I really love those three darker rings on your Single Girl! It really adds interest...way to be a little big different! OH I love the name "put a ring on it". and the quilt looks fabulous! Great work. Hopefully you'll have the patience to go back to your weekender soon. Love those curved blocks too. Curves are on my to-do list too. And I LOVE that you are doing the colors from Lee's button. That will be fun. LOVE the Single Girl quilt, Cindy! It's one of my favorite designs. Great job! Oh yes, that supernova is going to be fabulous! Your single girl is so great, congrats on finishing it up! I love your Supernova block! The curves are wonderful too! Cute name. Nice job on the quilt. Your Supernova looks beautiful! I love your Single Girl quilt and your other blocks look perfect!! Quilting with friends is my all time favorite thing to do...so much fun. You are certainly on a roll with all of your projects. I am looking forward to FWQ book being in my box when I return home! I'm extremely impressed with your output this week - wow! Put a Ring On It is a perfect quilt name. I adore the random rings of solids - very sparkly. And I agree that Supernova is one fabulous pattern. Great use of value in your Single Gal! your supernova block in batiks and grey is stunning! nice color choices!!! your single girl quilt is STRIKING with the 3 dark rings and the lighter rings. so so so good!! !